Really excited to see the wedding photographs today of a beautiful wedding at the West Mills wedding venue in Derbyshire, that we were privileged to be a part of back in May. 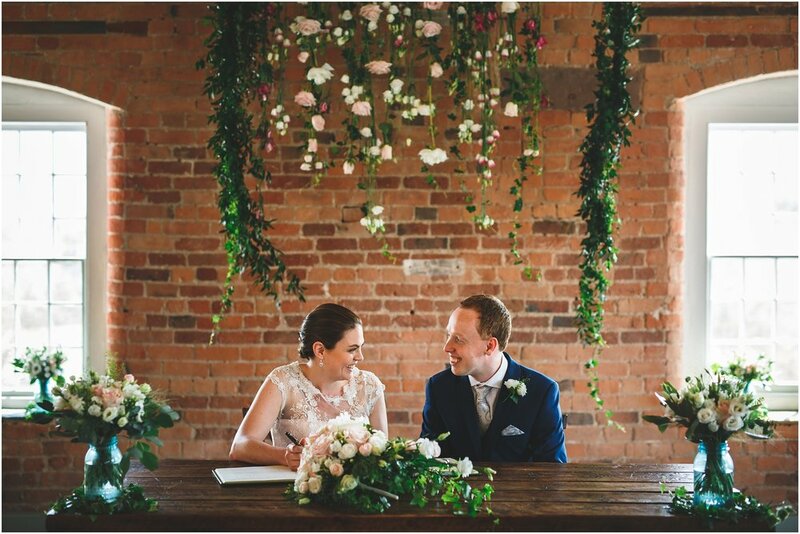 The Bride and Groom chose us as their wedding florist for their Derbyshire wedding, and we are so pleased that they did! Gorgeous blush pink Roses, dreamy Peonies and stocks featured heavily throughout the day, along with lots of trendy Pantone2017 inspired foliage. We also loved creating their ceremony backdrop, for their industrial styled wedding, which was a perfect frame for the ceremony. The West Mills staff are absolutely brilliant, as they then moved it to the reception as a top table backdrop. Here are some of the images kindly supplied by Gareth Newstead. Award winning wedding flowers in one easy budget friendly package. What if you could have amazing, award winning and beautiful wedding flowers in 3 easy steps? Kerry at Tineke Floral Designs, decided to launch this new concept for wedding in Derbyshire and Nottinghamshire. Tineke To Go offers you a simple and easy service, if you are looking for a straightforward and simple approach when choosing your wedding flowers in Derbyshire and beyond. You can be assured that each and every floral arrangement is created by our qualified and experienced florists at our Derbyshire studio, backed up by our reputable company, Tineke Floral Designs. All of our Tineke To Go bridal packages include 1 bridal bouquet, 1 adult bridesmaid bouquet and 1 Grooms buttonhole. You are able to add extra buttonholes, bridesmaid bouquets and even table centrepieces if you wish. Check out the range available, images by Matt Brown. © Copyright 2012 - 2017 Tineke Floral Designs Limited, All rights reserved | Designed by Miss Sammie Designs.